Haruko has an academic background in molecular biology and media arts. Her interest in science and art began at an early age; she has always been thinking about how she can combine her interests. After she finished her masters degree in Molecular Biology at the University of Tokyo, she decided to explore more about 'Art of Science' and 'Science of Art' for her career in the future. 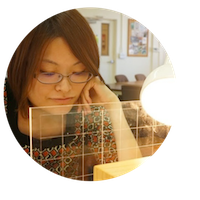 She hopes to encourage science research activity and stimulate science community in Japan through her art work as much as she can. She is now working as a freelance Scientific Illustrator and 3D Visualization Artist based in Japan.